Universal City, Cali. – Ron Meyer, Vice Chairman, NBCUniversal; Academy®, Emmy, Golden Globe and BAFTA award-winning filmmaker Steven Spielberg; Emmy Award-winning filmmaker Jordan Peele (Get Out); Emmy Award-nominated filmmaker Will Packer (Straight Outta Compton); Academy Award®-nominated and Emmy Award-winning producer Jason Blum (Get Out); and Karen Irwin, President & COO, Universal Studios Hollywood, celebrated the grand opening of Universal CityWalk’s multi-million dollar AMC Theatre renovation to create an all-new state-of-the-art Universal Cinema. Universal Cinema’s top-to-bottom makeover coincides with Universal Studios Hollywood’s ambitious epic transformation to reimagine the world-class entertainment destination. For film buffs, Universal CityWalk has long been the epicenter for fans seeking an environment that matches the excitement of their favorite blockbuster movies. Delivering modern, high-tech elegance and chic sophistication, the renovation of the split-level movie theatre offers a stylish and inviting place that captures the spirt of the glamourous movie studio—complete with screening room quality theatres and ultra-plush reclining seats. The Director’s Lounge Cocktail Bar—an all-new upscale and stylish second-level retreat, flanked by the upper level theatres—adds a charismatic new dimension to the space for casual pre- and post- movie-going fun. Beverages served at the lounge can also be taken into the second level theatres. Each redesigned theatre has been fully upgraded with the most technologically advanced sight and sound achievements. 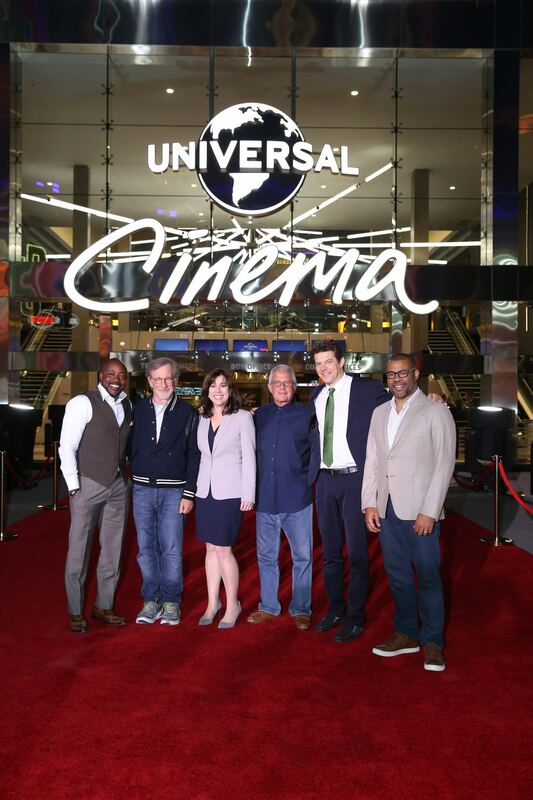 The Universal Cinema represents the first multiplex in the United States to incorporate Christie laser projection, Christie Vive audio sound system and Dolby ATMOS with recliner seating to deliver maximum-impact movie presentations in 18 auditoriums. The installation of new state-of-the art screens, perforated to enable 360 degree audio, complement the overall enhancements. The recent upgrade to the IMAX theatre features IMAX’s next-generation 4K laser projection and 12-channel sound systems designed to enhance the entire movie-going experience and provide an audience with sharper, brighter, clearer and more vivid digital images than ever. A departure from traditional movie concession stands, the completely redesigned AMC Marketplace offers movie-goers a contemporary grab-n-go, self-service experience, featuring a delectable new take on concession favorites, including specialty popcorn, gourmet foods, real fruit smoothies, café style coffees and a Coca-Cola Freestyle self-service touch screen soda fountain featuring 165 different Coca-Cola drink products. A box office and guest services concierge is now located inside the venue, with convenient automated box office kiosks situated adjacent to the venue by the “5 Towers” outdoor concert stage. Additionally, movie-goers can enjoy $5 Movie General Parking with the purchase of a movie ticket. Since 1993, CityWalk has boosted the city’s rhythm through a foundation built on providing memorable entertainment experiences. With a series of dramatic enhancements currently underway from the introduction of new dining experiences such as the recently opened Jimmy Buffett’s Margaritaville, Voodoo Doughnut, and LudoBird, shopping experiences and visually aesthetic design features, CityWalk continues to resonate as one of L.A.’s most influential lifestyle centers. More information on CityWalk is available at www.CityWalkHollywood.com. Regular updates can also be found on CityWalk’s Twitter @CityWalkLA, Facebook-Universal CityWalk Hollywood and Instagram @CityWalkLA. Universal Studios Hollywood™ is The Entertainment Capital of L.A. and includes a full-day, movie-based theme park and Studio Tour. As a leading global entertainment destination, Universal Studios Hollywood delivers highly themed immersive lands that translate to real-life interpretations of iconic movie and television shows. Recent additions include “The Wizarding World of Harry Potter TM” which features a bustling Hogsmeade village and such critically-acclaimed rides as “Harry Potter and the Forbidden Journey” and “Flight of the Hippogriff™,” Universal Studios Hollywood’s first outdoor rollercoaster, as well the all-new “The Walking Dead” daytime attraction. Other immersive lands include “Despicable Me Minion Mayhem” and “Super Silly Fun Land” as well as “Springfield,” hometown of America’s favorite TV family, located adjacent to the award-winning “The Simpsons RideTM”. The world-renowned Studio Tour is Universal Studios Hollywood’s flagship attraction, inviting guests behind-the-scenes of the world’s biggest and busiest movie and television studio where they can also experience such authentic and immersive thrill rides as “Fast & Furious—Supercharged.” The destination also features the Universal CityWalk entertainment, shopping and dining complex, including the Universal CityWalk Cinemas and the “5 Towers” state-of-the-art outdoor concert venue.